One of the first runs recorded in human history is mentioned in the Bible, in the beginning of the book of Samuel. At the end of the war between the Israelites and the Philistines, the “Man of Benjamin” runs from the battlefield at Eben Ezer (modern day Rosh Ha’ayin) to Shiloh, city of the Tabernacle. Today, thousands of years after the historic run, it has been commemorated once again. The route runs from Rosh Ha’Ayin inside Israel and then goes eastward through the West Bank, ending at the ancient biblical site of Tel Shilo, just outside the Jewish settlement bearing that name. Event take place at Sukkot (Tabernacles) holidays. Time when Jewish leave houses to eat and sleep in huts which they build outdoors. Time to remember the history, the travels in the desert, and the entering the land of Israel for the first time as a nation. People leave familiar material possessions at home and leave comfort zone to remember history and connect to the ancient roots. 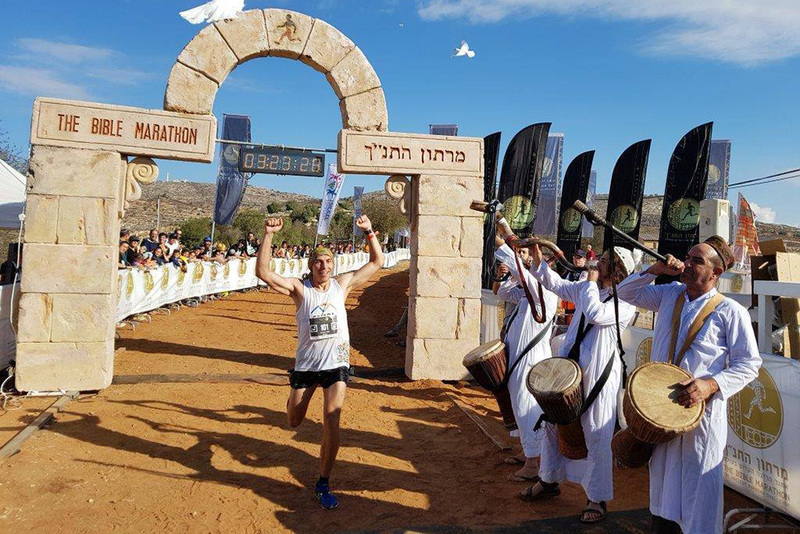 The Bible Marathon is a marathon of ascent, both topographically and spiritually. It’s unique experience to run the same route which “A man of Benjamin” ran 3000 years ago.